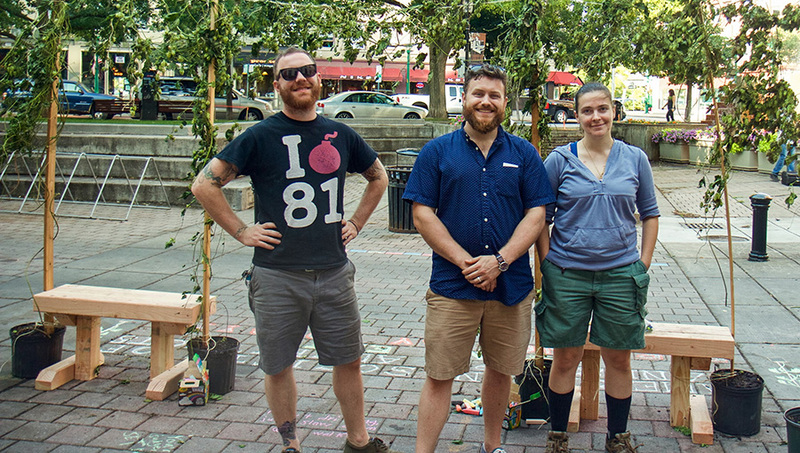 Landscape Architecture students from the College of Environmental Science and Forestry (ESF) celebrated PARK(ing) Day by transforming parking spaces in Syracuse's Hanover Square into a greenspace for the day. PARK(ing) Day is an annual event that encourages community members, students and designers to transform metered parking spaces into temporary public park spaces. "The vast majority of outdoor urban space is dedicated to the private vehicle, while only a fraction of that land is allocated to open space for people," according to information provided by the students. This year PARK(ing) Day was celebrated Sept. 21. "It's an opportunity to get people to ask, 'What else could happen in that space?'" said graduate student Kyle Stillwell. Stillwell was part of six-student team who designed and planned the installation. There were also three other students who helped build it and staff it throughout the day, according to Stillwell. The ESF installation envisioned East Genesee Street as a pedestrian space by creating a small park in two of the parallel parking spaces between business fronts and Hanover Square. The parklet featured an arbor covered with hops vines - a reference to Syracuse's long history of brewing - seating and young trees representing efforts by ReLeaf Syracuse to increase forest canopy and green space in the city. "Syracuse has over 10,000 paved parking spaces - not including on-street parking," said Stillwell, "but only 13 square acres of public park space." The original design for Hanover Square by ESF alumnusThomas Balsley (LA '68), an award-wining designer known for his fusion of landscape and urbanism in public parks and plazas, did not include parking, said Stillwell. "It was intended to be a pedestrian space." According to information displayed at the site, Hanover Square forms a slip lane - a traffic lane that cuts the corner at an intersection. "These driving situations can be dangerous for confused motorists and pedestrians. Many cities across the nation are reconfiguring slip lanes as pedestrian space, instead of space for cars. Why can't Syracuse?" With recent renovations to the nearby State Tower building that include apartments, offices and retail space, Stillwell noted that access to outside pedestrian space would benefit not only building tenants but surrounding businesses as well. "Pedestrian spaces activate business," said Stillwell. "You'd sacrifice a dozen parking spaces to attract more foot traffic." Studies have shown an increase in greenspace leads to more foot traffic which translates to an increase in revenue for the local business, he said.